Prior to puck drop, the Bruins organization handed out a bevy of regular season awards to celebrate another successful season in Boston. Neither team was too aggressive in the early going, undoubtedly trying to avoid any injuries and not expend too much energy. Scoring chances were few and far between in the opening period as neither team could get consistently good shift in the opponents zone. The Bruins started to get an attacking zone rhythm in the middle stages of the period thanks to a solid shift by the third line. Tuukka Rask made a nice stop on Mathieu Joseph to keep the game scoreless with about 10 minutes left in the period. The B’s seemed to be the more aggressive team in terms of scoring chances in the first period as they strung together a couple great offensive shifts. A nice passing sequence by the Bruins resulted in David Krejci knocking home a loose puck in front to give Boston the lead. The Bruins continued to be quick to the puck and continued to get chances in the offensive zone as they looked to extend their lead. Danton Heinen doubled the Boston lead with just 19 seconds left in the period on a beautiful shot past Pasquale. The Bruins went to the penalty kill as Joakim Nordstrom slashed Steven Stamkos about three minutes into the period as the Lightning looked to get back into it. Erik Cernak cut the lead in half with a dart of a shot past Rask on the man advantage. Erik Cernak scores on the power play and the Bolts are on the board! The Bruins seemed to respond well to the Lighting goal as they got their skating legs back under them. 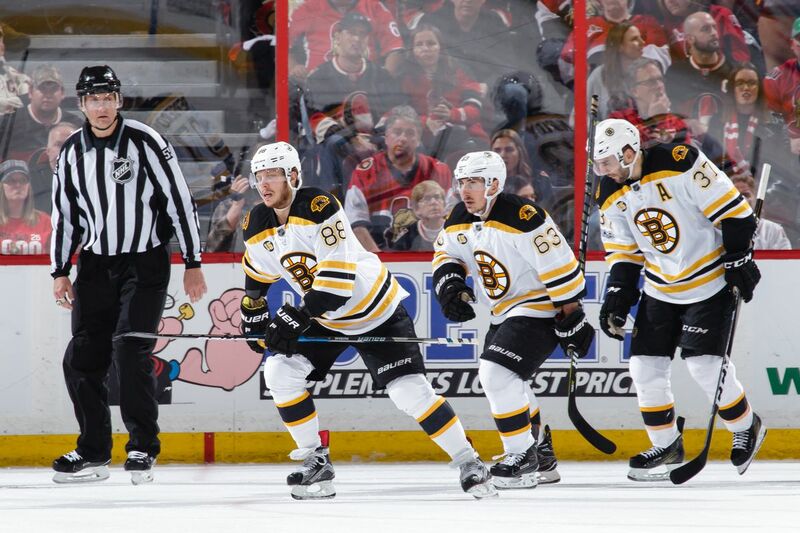 The B’s continued to be very hungry on the puck toward the midway point of the game as the looked to assert control. The Lightning looked a lot more comfortable handling the puck in the second period with a lot more noticeably crisp passes. The Bruins would head to their first power play as Nordstrom was hit by a high stick with over seven minutes remaining in the period. After a bad turnover in the offensive zone, Stamkos skated in on a breakaway that tied the game as the Bruins gave up yet another shorthanded goal on the season. The Lightning killed off the Boston power play despite some good puck movement by the B’s. Pasquale continued to have a strong game with a couple huge saves late in the second period. Anthony Cirelli buried a shot in the slot with about three minutes left in the period to give Tampa their first lead of the game. The Bruins challenged the goal for goalie interference but unfortunately to no avail. After Krejci was hit hard by Joseph, David Pastrnak took a penalty for roughing with just over two minutes left. The B’s killed it off and kept it a one goal game. Just 53 seconds into the period, Nikita Kucherov made an incredible individual play in the offensive zone to double the Tampa Bay advantage. The Bruins continued to get some good scoring chances in the final period as they moved the puck pretty well in the offensive and neutral zones. The B’s would go to the man advantage with under fifteen minutes remaining in the game as Tyler Johnson was called for tripping. Tampa Bay killed off the penalty despite the Bruins getting some great opportunities. The game started to get very nasty towards the end of the period as both team began to throw their weight around. Both Joseph and David Backes would go to the box for roughing following a scrum in front of the Tampa Bay bench. Matt Grzelcyk found the back of the net on the ensuing four on four to cut the deficit to one on a nice wrist shot. Just mere seconds after the goal, Brayden Coburn somehow found the net on a long wrist shot as Tampa Bay regained their two goal advantage. Immediately following a Bruins goal by Grzelcyk, Brayden Coburn RESPONDS with a goal from barely inside the blueline! The Bruins pulled the goalie with under three minutes to go as they tried desperately to get back into the game. Johnson ended it with an empty net goal with 1:26 to go. First Star: Brad Marchand. The feisty winger had his best career season, surpassing 100 points for the first time and being the best offensive player on the team all year long. Second Star: Patrice Bergeron. Amazingly, Bergeron set a career high in points this season despite missing a decent chunk of the year. He continues to impress every single season. Third Star: Krejci. Despite a revolving door of winger at certain moments, the veteran center tied a career high in points and looked to be at his very best at multiple times of the year. The Bruins quickly turned the heat up in New Jersey after a quiet first period that saw Patrice Bergeron score his 29th goal of the season (his first of the night). With nine games left in the regular season, Boston continues to rack up points and with the win against the last-place Devils, they extend their lead for second place in the Atlantic Division. The first line alone combined for eight points tonight. Josh Jacobs makes his NHL debut tonight with New Jersey. Bruins John Moore returns to his old stomping grounds, after playing for New Jersey three seasons. Captain Zdeno Chara still looking to score his 200th career NHL goal. With both teams tallying up an even amount of shots on goal in the first, the boys in Black and Gold would set the tone of the game after a beautiful snapshot goal by Patrice Bergeron at 18:34 in the first period. Bruins Captain Zdeno Chara would hustle up the ice sending a crossfeed pass to David Pastrnak, who banked a deflected shot on goal. In a failed attempt to nudge the loose puck past Schneider, Brad Marchand quickly scooped it up, sending it to Pastrnak who in turn found an open Bergeron in front of the net, firing it past Schneider. 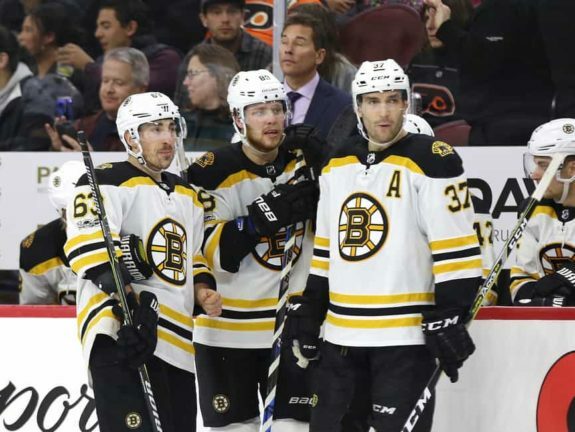 With a late goal in the first period, the Bruins never looked back as they continued to create chances in front of the net down New Jersey’s end. After a face-off win, Marchand would feed the puck to his linemate and at 12:58 in the second, David Pastrnak netted his first goal since returning from thumb surgery (and his 32nd of the season). 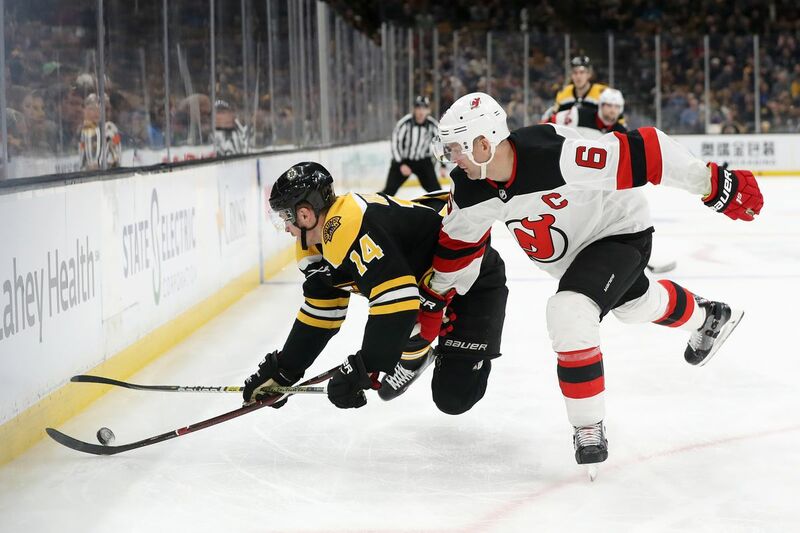 In their lone goal of the night, New Jersey’s Drew Stafford would get the Devils on the board as Pavel Zacha intercepted a pass by Jake DeBrusk, beating Tuukka Rask on the net, making the score 2-1 Bruins. Sean Kuraly would take a slap shot from Jersey’s Steven Santini, sending Danton Heinen and Chris Wagner on a 2-1. Heinen would score off a wrist shot 29 seconds into the third, giving the Bruins a nice cushioned 3-1 lead. Kuraly, unfortunately, did not return to the game. As the third period came to a close, Patrice Bergeron would net his 30th goal of the season on an empty net at 18:42, making the score 4-1. With Cory Schneider back in net, David Backes would score off a redirect, making the final score 5-1. Cory Schneider made 22 saves for the Devils. The Bruins have a six-point lead over Toronto and will continue their four-game road trip as they head down to Florida. New Jersey has been mathematically eliminated from the Playoffs. Boston now improves to 45-20-9 and are at 99 points. New Jersey fell to 27-39-9. NEXT GAME: BRUINS VS FLORIDA, Saturday 23rd with puck drop at 7:00 PM, BB&T Center. 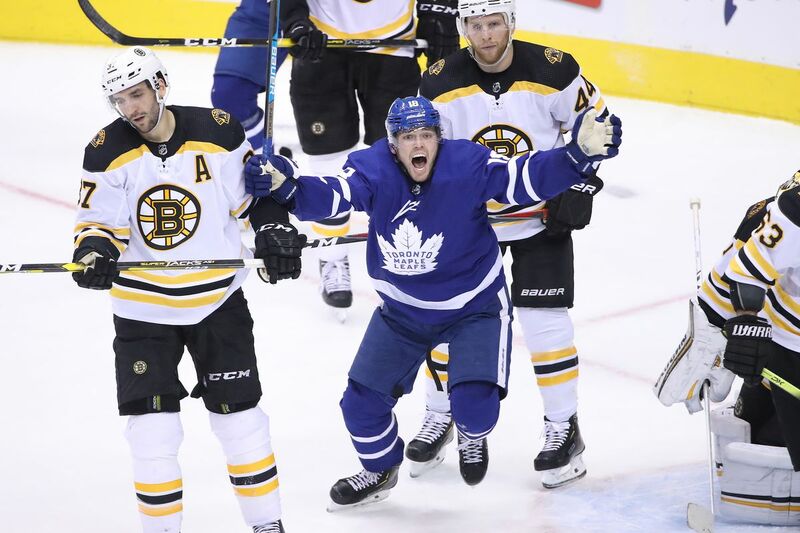 Bruins fans rejoiced as David Pastrnak made his long-awaited return in this one. It didn’t take long for the scoring to begin, as it wasn’t Pastrnak, but rather Sean Kuraly who put the Bruins ahead just a minute and 12 seconds into the game. Kuraly’s first in 23 games and seventh of the season was assisted by Charlie McAvoy (19). The Bruins dominated early on when it came to creating offense through the neutral zone and good shot attempts. Despite the Bruins holding significant control of the game for much of the period, they were ahead by just a goal after one. Sean Kuraly especially, even outside of his goal was buzzing in a strong first period as a unit. Shots were heavily in the Bruins favor at 14-2, in part thanks to six Islanders giveaways. The action picked up early again in the second period when Zdeno Chara and Matt Martin squared off with one another. Chara’s first fight as a 42-year-old. With a hefty advantage when it comes to his wingspan and physical frame, Chara got the better of Martin in the fight for the most part, but Martin definitely got some good shots in. Per TSN StatsCentre, Chara is the first player of 42 or more years of age to earn a fighting major since Mark Recchi in 2010, ironically enough, while Recchi was on the Bruins. The bottom-six continued to show up on the scoresheet. This time it was Noel Acciari getting on the board. He kept his head up, pounced on a turnover by Cal Clutterbuck, and quickly buried it to give the Bruins the two-goal lead. The Islanders couldn’t really get anything established consistently for the majority of the first half of the game. 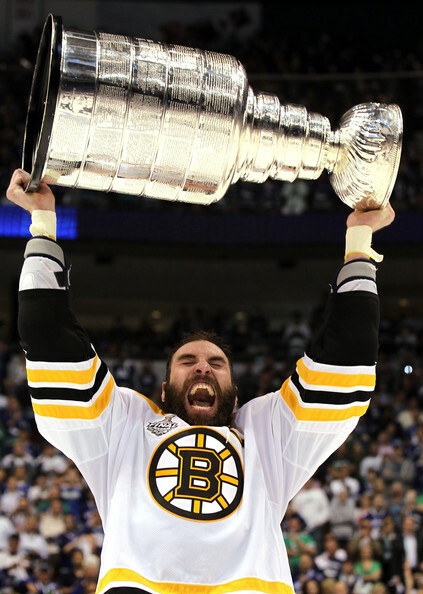 It was all Bruins. An opportunity did come in the form of a power play for them when Pastrnak went off for 12:33 for high sticking, but they failed to convert on it. Tuukka Rask made his first big save due to a lack of shots about 11 and a half minutes into the period. Kuraly potted another one late in the period for his second. Last time he buried two goals in a game was against Ottawa in the 2017 Stanley Cup Playoffs. His eighth goal of the season was assisted by Danton Heinen (21). Danton Heinen sets up Sean Kuraly for his second goal of the night. Soon after the goal, a power play ensued for the Bruins. No dice before the end of the period though. For what it’s worth, Pastrnak played 10:26 through the first two periods. 24-8 were the shots at the end of two in favor of the Bruins overall, 10-6 in the second period. Things took a little longer to get going in the third compared to the first two periods. Patrice Bergeron got things going this time. I can’t remember the last time the first three goals of a Bruins game were scored by bottom-six forwards. John Moore (8) and Joakim Nordstrom (4) had the assists. Jake DeBrusk then took a penalty not too long after for hooking. The Islanders didn’t score on the power play, and then DeBrusk scored his 23rd goal of the season on a breakaway out of the box. The final shots were 39-13 Bruins, and 15-5 in the third period. This was a blowout through and through and a statement road win to start the four-game road trip. Next up for the Bruins are the Devils at 7 PM on the road on Thursday. Both teams had some early chances as the they looked locked in from the very beginning. Alex DeBrincat opened the scoring just 4:22 into the game as his shot somewhat got through Tuukka Rask’s blocker and into the net. The Bruins fourth line responded with a very solid shift but Colin Delia stood tall to preserve the early lead. After a collision in front of the Chicago net, Brad Marchand was somehow called for goaltender interference after being pushed into Delia by Patrick Kane. The Blackhawks picked up the game’s first power play. Zdeno Chara was called for roughing during the man advantage, giving the Blackhawks a five on three. The B’s killed both penalties as Rask and the defense held up to keep it a one goal game. 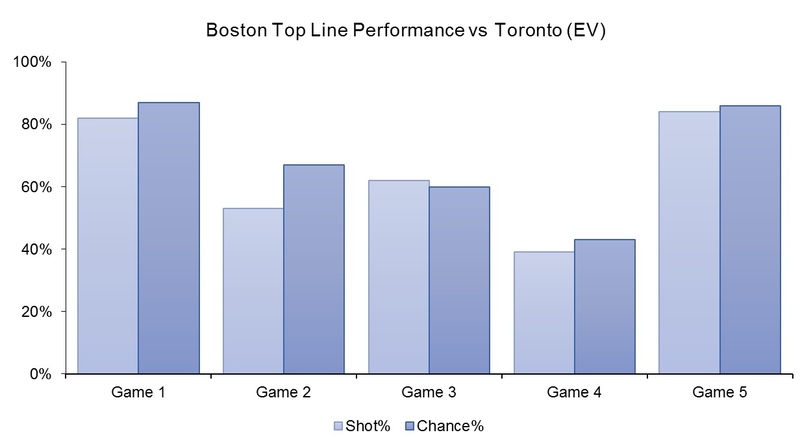 The B’s continued to get the better of the scoring chances as they developed an offensive rhythm in the middle stages of the period. The Bruins got a power play after a tripping penalty to Brent Seabrook. David Krejci tied the game on a one timer after a beauty of a feed from Patrice Bergeron. David Krejci is doing a pretty solid job filling in for David Pastrnak on the power play. 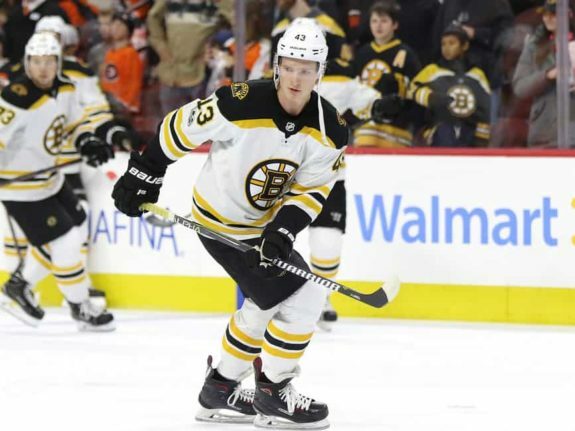 The Bruins continued to be hounds on the puck and Danton Heinen was rewarded with a rebound goal after a shot by Chara to give the B’s the lead. The B’s continued to be quick to the puck, forcing turnovers and getting good scoring chances from good areas in the Chicago end. The Bruins made it three consecutive goals as Marchand buried a feed from Heinen in front of the net with about a minute to go in the period. Rask had to make a few stops in the opening moments of the middle period as he looked to be a lot sharper than in the first period. After a slow start to the period, the game started to open up as both teams got their skating game going. The second line started to find an offensive rhythm in the middle part of the period as Jake DeBrusk seemed to have a hop in his step. Another great shift by the fourth line nearly resulted in the Bruins extending the lead but Delia continued to have a strong period to keep it a two goal game. Krejci was cut down in the attacking zone which resulted in another Boston power play with 8:11 to go in the period. The Blackhawks killed off the penalty as the Bruins failed to get any significant scoring opportunities. The B’s would get another man advantage opportunity as Heinen was roughed up in the neutral zone with just over four minutes left in the period. Jonathan Toews was called for a high stick just 20 seconds into the power play as the B’s would get a five on three. The Blackhawks killed the penalty but DeBrusk scored immediately following the man advantage to make it a three goal lead. Jake DeBrusk snaps a streak of 13 straight games without a goal. Duncan Keith cut into the lead with a slap shot from the top of the circle with only 22 seconds to go in the period as the Hawks got a huge goal. Duncan Keith responds with a laser before the end of the 2nd! The Bruins went to the penalty kill early in the period as Toews was taken down by Sean Kuraly in the attacking zone just 1:16 into the final frame. The B’s killed it off despite four shots on goal by the Hawks. Both Noel Acciari and John Hayden went off for roughing minors which resulted in a four on four situation. Erik Gustafsson found the back of the net as he walked in on Rask and beat him with a wrist shot to make it a one goal game. The Hawks were hit with another penalty during the four on four which resulted in yet another Boston power play. Peter Cehlarik made it a two goal lead again after two great plays by Heinen and Torey Krug on the man advantage. Torey Krug does Torey Krug things on the power play. Danton Heinen sets up Peter Cehlarik for his fourth goal of the season. The Bruins continued to push for another goal as they peppered Delia with shots from all angles. Rask improved his play in the third period as he withstood a few Chicago rallies. Krejci made it two on the night after an outstanding shift and a sweet feed from Marchand to make it 6-3 Bruins with over four minutes remaining. First Star: Heinen. The young winger had perhaps his best game of the season with three points and looked like the impressive player from last season. Second Star: DeBrusk. Number 74 was at his best in this one and found the back of the net on a great tip and also added two assists. Third Star: Krejci. The center was solid in this game and was a great finisher, scoring two goals.